The moray eel has such an unfair reputation. Looks can be deceiving. 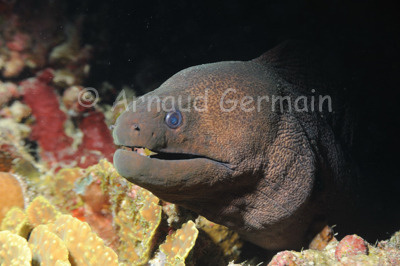 The fact that moray constantly opens and closes its mouth to breathe and in process flashes its sharp teeth makes it look ferocious. As with most citizens of the animal kingdom, if you leave it peace, it will leave in peace too. Accidents have happened when people started feeding these impressive fish. This one was a large specimen- about 1.5 metres long- and it let me get close to get a nice series of shots.